In the second of this week’s mini development updates we are covering The Hideaway hotel in the Dominican Republic, where construction is due to start later this summer. The Hideaway will be a luxury boutique hotel comprising 238 studios and apartments arranged around a beautiful pool – with its own bar and concierge service – which will be just steps away from a pristine, white sandy beach. Harlequin’s planned Las Canas Resort will be situated just half-a-kilometre away, affording guests of The Hideaway the opportunity to use its excellent facilities. 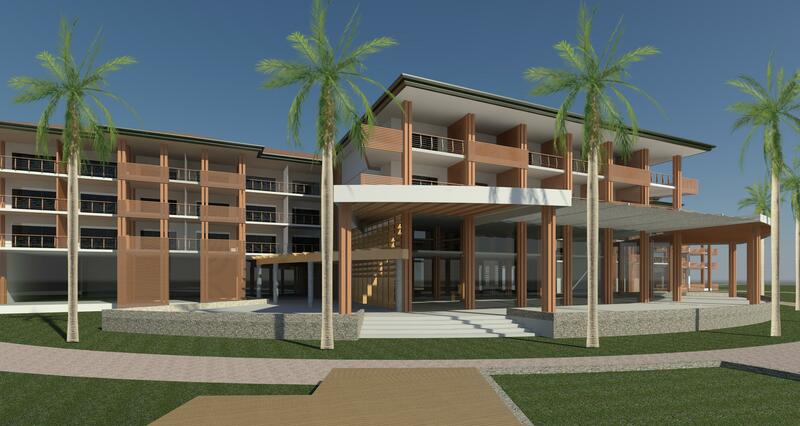 A two-tier beach club will feature a Bay Beach Club – as Harlequin currently offers at Buccament Bay Resort – on the lower level, whilst the upper level will offer a fine dining restaurant. The hotel boasts a HQ (you have no idea how great a feature that is until you try the ice cream at Bucc Bay or blu St Lucia!) and a stunning conference and banqueting space on the second floor of the central building, providing spectacular views over the gardens and pool to the sea beyond. Also, ESPA have designed the spa, which will cover around 1,200sqm – that’s without counting the gym that will accompany it. Harlequin is currently purchasing 1,000sqm of land one kilometre inland from the site, which will host a well and small treatment plant to support the water supply into the resort. Earlier in May, details were submitted to the Treasury Department in the Dominican Republic that highlighted the jobs to be created through both the periods of construction and its opening as an operational hotel, just as at Buccament Bay Resort. If you’ve ever wanted to find a hideaway, Harlequin will have the perfect option for you soon! This entry was posted in Harlequin Hotels & Resorts, The Hideaway and tagged development, development update, Dominican Republic, Harlequin Hotels and Resorts, Harlequin Property, Hideaway, progress, The Hideaway. looks great cant wait for it to be finished. glad i have invested on the hideaway. Me too. So pleased I invested here at just the right time…..